This customized popup card order we received was for our client's dear friend's birthday. She wanted something really spectacular, and asked us to recreate fireworks exploding into the night. On the inside of the card, she wanted a rabbit popping out of a magicians hat, complete with a stage and curtains as well. The adorable rabbit was made from felt sheets to give it a furry look. Jacqueline wanted a modern Chinese wedding invitation to celebrate her wedding solemnization ceremony. Initially, she wanted the flower bunch design, but after much deliberation, she decided on a romantic heart swirls design instead. In keeping with the Chinese tradition, splashes of red is added to the wedding invitation card for good luck! The triple layered invitation card contains her English invitation wordings on one side, and Chinese invitation wordings on the reverse side. Faux diamond beads were added to the card for a touch of glitz. We received an order for a pink baby card, to congratulate our client's friend on her newborn baby. 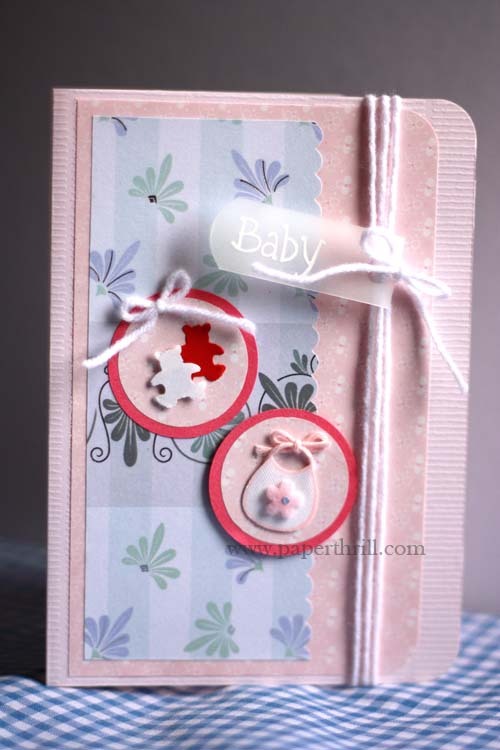 We used soft hues of pink and blue for this handmade newborn baby card. Teddy bear cut outs and a mini baby bip layered on round tags accentuate the card. The pink floral and wallpaper-like designer paper adds softness to the card.